Posted on 10, April 2018 by EuropaWire PR Editors | This entry was posted in Austria, Business, Financial, Germany, Internet & Online, Investment, Netherlands, News, Real Estate, Small Business, Technology, United Kingdom and tagged Alternative Financing, Blockchain, CONDA, crowd sale, crowdfinancing, Crowdinvesting, CRWD Network, CRWD Token, cryptocurrency, ICO, initial coin offering, investments, mezzanine, private equity, private equity instruments, real estate, regulatory-compliant investment, RIAT, smart contracts, SMEs, Startups, The Institute for Future Cryptoeconomics, tokenized private equity instruments, traceability, transparency, whitelisting, whitelisting phase. Bookmark the permalink. On Easter Sunday, April 1st 2018, Austrian crowdfincancing platform CONDA began the whitelisting phase of its Initial Coin Offering (ICO). Moving forward, interested parties can register online, even before the official start of the crowd sale. 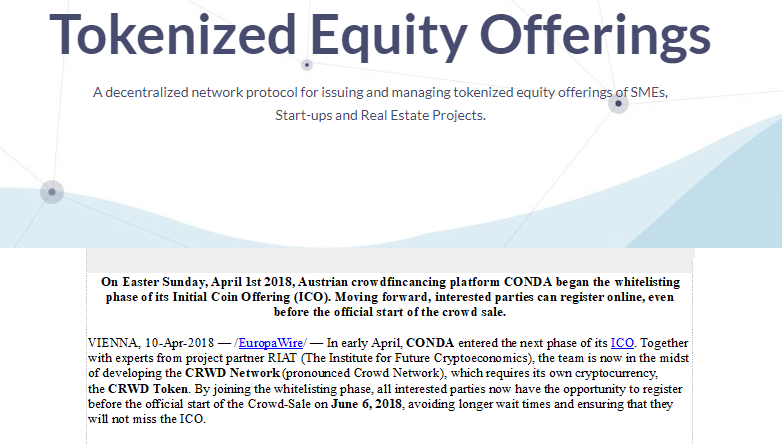 VIENNA, 10-Apr-2018 — /EuropaWire/ — In early April, CONDA entered the next phase of its ICO. Together with experts from project partner RIAT (The Institute for Future Cryptoeconomics), the team is now in the midst of developing the CRWD Network (pronounced Crowd Network), which requires its own cryptocurrency, the CRWD Token. By joining the whitelisting phase, all interested parties now have the opportunity to register before the official start of the Crowd-Sale on June 6, 2018, avoiding longer wait times and ensuring that they will not miss the ICO. The CRWD Network is a decentralized network protocol on the blockchain, providing regulatory-compliant investment in SMEs, startups and real estate projects. Any platform on the network can take advantage of the benefits of the CRWD network. As a result, CONDA is setting new standards across Europe: companies use the network protocol, supported by various crowdfunding platforms, to issue tokenized private equity instruments (e.g. company shares, subordinated loans, etc.). This solves a widespread problem of the current crypto scene: the need for financial products to operate within a legally-compliant framework. 5 years ago, CONDA started as a crowdinvesting platform, transformed into a crowdfinancing platform and is now ready for its next phase: the CRWD Network. A decentralized, regulatory-compliant crowdfinancing infrastructure protocol forms the basis of all transactions within the network. The CRWD Token is required for all CONDA business services and fees. Investments may continue to be made in the national currency (e.g. EUR).